After impressing in national tournaments for Việt Nam, goalkeeper Đặng Văn Lâm has secured a move to Muangthong United FC of Thailand. The number one goalkeeper of the Vietnamese team was paraded in front of the Thai media at his new club on Thursday. Hundreds of Thai reporters surrounded Lâm and put questions to him relating to his three-year contract for Muangthong United. Lâm said he was very happy to join the the club as he had been following this team for a long time and knew this was a strong team in the region. He pledged to do his best to help the club win the Thai League this year. 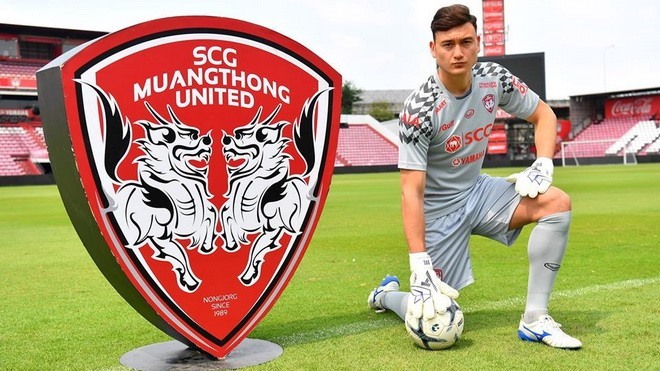 Meanwhile, Muangthong United FC chief executive Ronnarit Suewaja said although the club already had goalkeepers with potential for growth, the ambition of the club meant they wanted to sign Lâm. The decision to recruit Lâm was backed by the board of directors and coaches, he said. Lâm believes this is the right move to help his career develop, Suewaja added. Muangthong United FC of Thailand paid a transfer fee of VNĐ3 billion (US$130,000) to Hải Phòng FC for Lâm’s services. The three-year deal see Lâm earn $10,000 a month. The club will also provide him with an apartment and a car. Lâm, 25, is a rising star in the region after he played key role in Việt Nam’s ASEAN Football Federation Cup triumph. He was also voted the best keeper of the tournament and was selected in the Cup’s Best XI. "After the AFF Cup success, I received people’s attention and support and there would be good conditions if I kept playing in Việt Nam. But I don’t want to stay in the ‘safe zone’, I want to be challenged and have new experiences in my career,” Lâm told zing.vn.